The most common skin problems begin below the surface of the skin. And while sagging skin and wrinkles can easily be solved with the use of a dermal filler, other problems can’t be fixed so easily, like sun spots. To combat these skin issues, you need a new kind of treatment. 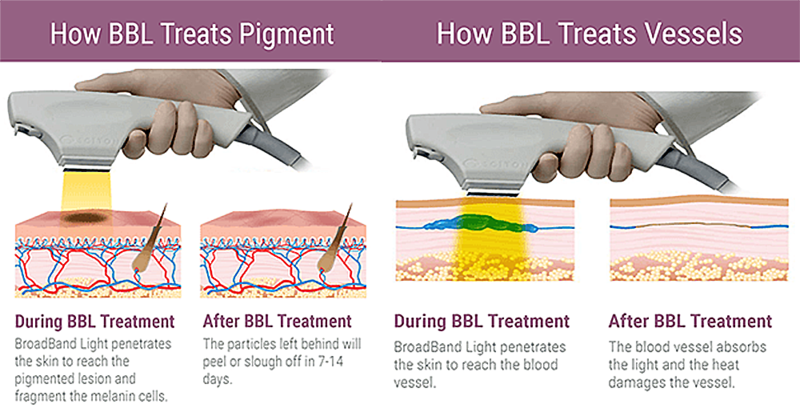 The Forever Young BBL (broadband light) system targets the causes of these annoying skin conditions and can reverse them in as little as a few visits. This system uses broadband light to penetrate the skin’s surface and gently heat the skin cells that lie underneath. This gentle heating causes the cells to be damaged, which causes the body to repair the skin by creating additional collagen. The additional collagen is new, unblemished skin and eventually replaces the affected skin. BBL wavelengths are easily customized to each patient, ensuring that they are getting exactly what’s needed to solve their problem. One of the best reasons to use Forever Young BBL is the treatments are effective, quick, easy and virtually painless. There is no downtime associated with this procedure. You can easily come from home or work, have your appointment, and return without any need for additional care. The only post-treatment care you’ll need to do is wear sunscreen to protect the treated areas. Forever Young BBL begins to work on your very first treatment; initial results can be noticed after a few days. Once your first appointment is completed, we will schedule your follow-up appointments. Procedures are usually done between 2 and 3 weeks apart. Full results are seen after 3 or 4 treatments.